One of the many reasons I love learning about, writing about, and baking pies, is for its darker, mythical origins. This article from NPR explores the heritage of medieval pie (which generally contained meat and had a dark, rich filling made of whatever the baker could get his/her hands on) and its linguistic connection to the magpie, those odd birds of variegated color who are known for collecting strange and shiny objects for their nests. 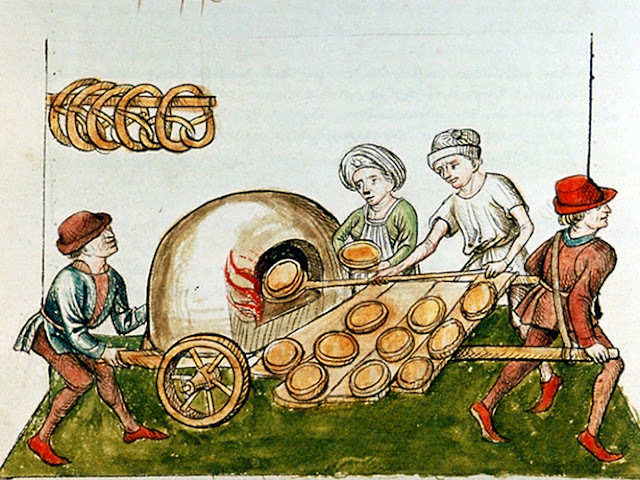 I also love this illustration, c. 1465-1475 of medieval pie bakers. Look at those pies! and those pretzels! And that wood fired oven on wheels! If only!